When Girl Scout Daisies (grades K–1) take part in the Girl Scout Cookie Program, they’re helping lead the largest entrepreneurial program for girls in the world. How? By learning essential life skills, setting (and crushing!) impressive goals, and using their cookie earnings to go on epic adventures and make the world a better place—wow! Many of these incredible skills start with a Girl Scout badge (some Daisy badges are called petals or leaves), and we’re exploring all of them! Meet the Daisy leaves Girl Scouts can earn during cookie season. By earning the Daisy Money Counts leaf, girls will not only learn about money but also its value! Daisies will first dive into the different types of currency they’ll encounter, from coins to paper money to credit cards. Then they’ll practice planning for something they’d like to buy one day. That’s right—even the youngest Girl Scouts are learning the importance of setting a budget, because when your troop girls set their cookie goal, they need to know how much it costs! Earn the Money Counts leaf. The Daisy Making Choices leaf goes even further into managing a budget. In one of the first lessons, and maybe the most important, girls learn the difference between needs and wants. Daisies will also practice setting financial goals, break down the costs of an item or activity, and determine how long it will take for them to save enough money to buy it. Last, Daisies take these new skills and discover ways to use them to give back—it’s the Girl Scout way, after all! Earn the Making Choices leaf. The Daisy Count It Up leaf is one of two leaves that focuses even more on the skills Daisies earn through the Girl Scout Cookie Program. After earning this leaf, girls will understand how their cookie money equals unforgettable experiences for their troop. Daisies will also take the lead to get to know their product by understanding the cost of the cookies, learning about the different flavors, and practicing answering customer questions. Then the troop will work together to decide how many boxes to sell during the upcoming season. Earn the Count It Up leaf. Through the Daisy Talk It Up leaf, the second Daisy leaf that focuses on the Girl Scout Cookie Program, girls decide how they want to use their cookie earnings. The best part about this leaf is that it’s all about teamwork, because cookie goals have to be decided as a troop—talk about girl-led! If these cookie bosses want to go to camp next summer (and maybe earn the new Daisy Buddy Camper badge), they have to work together to figure out how many boxes will get them there and build a plan to make it happen. Troops may also decide to leave budget aside to give back to their community, which our Girl Scout hearts love! And last, the troop will come up with unique ways to share its cookie goals with customers and how it’s running its own business to achieve them! 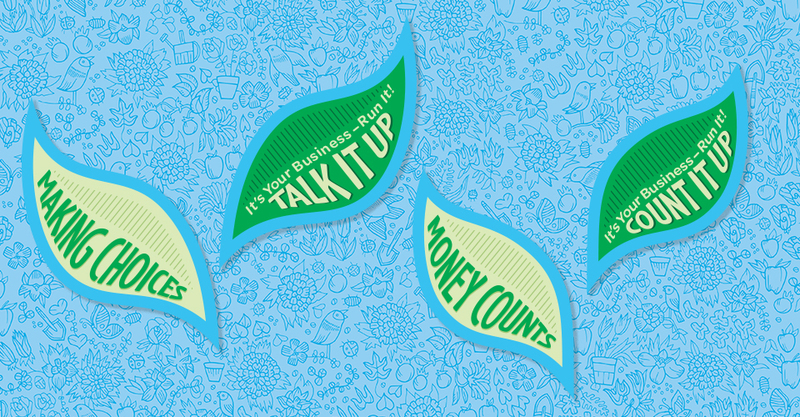 Earn the Talk It Up leaf. Has your Daisy earned one of these awesome leaves, and you don’t know where to place it on her vest or sash? Our new Daisy uniform visual guide can help!